Welcome to an outdoor experience at Munnar in Kerala. if you are looking for adventure, then we have the best suited accommodation in luxury tents or dome tents, all the while experiencing the great outdoors and adventure in the wilderness and wide open spaces. Nature hikes, mountain biking, nightly campfires and camaraderie inspired us to set up camps along the Sahyadris in and around the beautiful hill town of Munnar. The camps cater to a wide variety of people from the International traveller, the ambitious corporate executives, students exploring nature & wilderness and groups of all sizes and interests. From excellent local cuisine to a variety of outdoor activities, these camps are guaranteed to make the campers’ lives memorable. These camps are meant for the adventure minded individuals and groups wanting to get away from the heat and dust of the plains and the stressful living in cities. Discover the amazing richness of one of the 35 bio-diversity regions of the world, discover yourself as you navigate the tough mountain trails while all the time making new friends and learning new skills ! Other activities to enthuse the adventurer in you is to navigate through the hills, scramble up mountains, paddle along the beautiful Anaerangal Lake in a raft built by you & your buddies before finally spending the nights around the camp fires ! You will also undertake challenges in ways you never expected in your line of work and develop a new perspective on life as you work as a team and ready to meet challenges ahead! 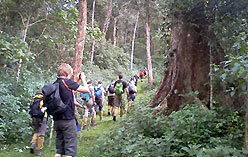 Munnar is synonymous with excellent trekking trails through one of the highest regions of the Western Ghats. 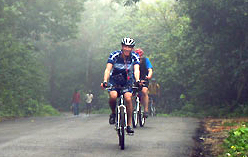 Associated activities like trekking, cycling & bird watching holidays would be the highlights of stay at these camps.